Oh hey. It’s been 4 months. We don’t even have to discuss this, we’ve been over it and I’m more than positive that everyone who reads this knows I am less than consistent. I am very sorry to you if my blog is the highlight of your week (yeah…right) and you’ve missed me terribly but, for the past four months, the highlight of my week has been going to bed. My body is not cut out for physical labor. By physical labor I of course mean reaching for purses, climbing three flights of stairs at least 15 times a day, and obviously getting up and getting dressed before the clock has double digits displayed on it’s face. It’s hard out there for a pimp…or I guess anyone out there who has a job. But really though, my abs hurt, my calves hurt, that muscle on the very front of my upper leg hurts. I’m falling apart. I need a massage more than Kathie Lee Gifford needs another glass of wine on the Today Show right now (I’m waiting for The Price is Right to come on, geez). I need someone to steal me one of those strollers from Disney World I insisted on making my parents push me around in until I was 9…okay fine, fine I was 10. OR maybe this is just a huge, big, fat sign that I need to go to the gym. 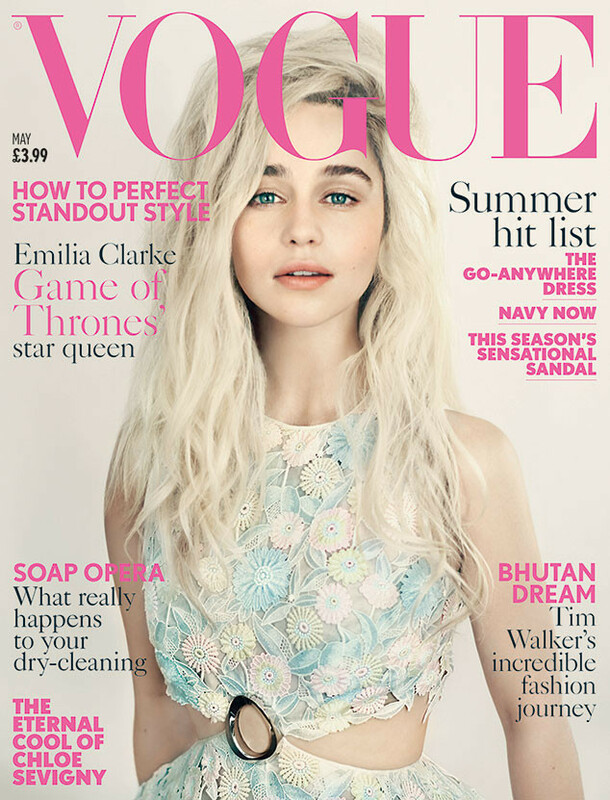 Anyways, first of all, can we talk about how insanely GORGEOUS Emilia Clarke looks on the cover of British Vogue in Dior Haute Couture this month? That bleach blonde hair, those killer eyebrows, and oh my gosh can I please just have her lips? Girl crush alert! As well as life envy alert. Why wasn’t I born the mother of dragons? This issue also has amazing stories on Gigi Hadid, my spirit animal of the past 6 months, and Chloë Sevigny, my spirit animal for always, so if you’re in the mood to spend $15 on a magazine, hit your nearest newsstand now! Yes, father I spent $15 on a magazine. See, my money does go towards important things. Since I’ve now been writing this article over the past 2 hours, long breaks included, and have had some time to contemplate on what I should write, I have decided to write about the skirt I purchased about 3 weeks ago. Why you ask? Reason #1 being that it is beautiful. Reason #2 is that I needed a smaller size than I originally thought (hell yeah size 27!) and this skirt is made of leather and runs small. Lastly, Reason #3…I have to make it worth it. Sooo you seeeee I had just gotten paid and at the store, if you spent over some amount of money that day, you got 15% off and reasons #1 and 2 were playing over and over in my head and if you’ve read any of my other shopping articles you know I cannot only justify buying anything, I also tend to black out a little while shopping so I make rash decisions…So, I bought it and therefore have been living on Eggo Waffles for the last week. I would have to wear this skirt everyday for over 2 years to make it free. My thinking on this blog post is that maybe putting so much thought into this wonderful purchase will shave off a few days. Because this skirt is so perfect, I wanted to showcase a couple of the different ways I was thinking of styling it while trying to justify buying it in my head. Vince Flat Slip on Sneakers– I bought these and I’m obsessed. Rag and Bone Perfect Muscle Tank– You can never own too many of their t-shirts. Scotch & Soda Vintage Inspired Bomber Jacket– Okay I bought this too. Whatever, it’s fine. DANNIJO Saxon Deco Dangles and DANNIJO Tenenbaum Ring– No, I unfortunately don’t own these. Charlotte Olympia Sophia Ankle Strap Sandal– I bought a similar pair at a sample sale. CC SKYE Sunset Boulevard Clutch– Really obsessed with this.